Along coastal British Columbia, from the north end of Vancouver Island to the southeast tip of Alaska, lies the Great Bear Rainforest and Haida Gwaii. The 6.4 million-hectare region is part of the world’s largest coastal temperate rainforest whose trees generate more oxygen than other temperate rainforests and hold some of the world’s largest stores of carbon. The region is comprised of the unceded territories of more than two dozen First Nations who have carefully stewarded the abundant natural resources of both land and sea for thousands of years by relying on their knowledge of seasonal cycles to harvest a wide variety of resources without depleting them. Yet by the 1990s, due in large part to industrial-scale forestry practices, nearly half a hectare of the vital landscape in these First Nations’ territories was being logged every minute. 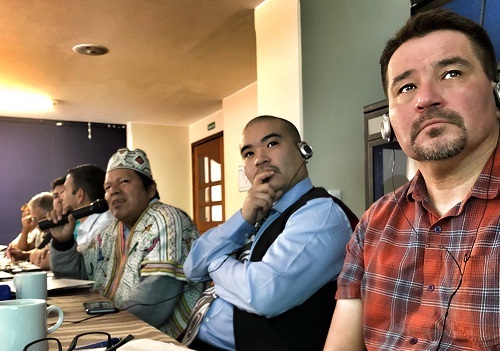 It was with respected leaders from two of these Nations—Merv Child, executive director of Nanwakolas Council, and Doug Neasloss, chief councillor of Kitasoo/Xai’xais First Nation—that I travelled to Bogotá, Colombia in February of this year. We would meet with delegates from Peru and Colombia, countries facing concerning levels of deforestation, to discuss Indigenous-led and permanently financed approaches to conservation. 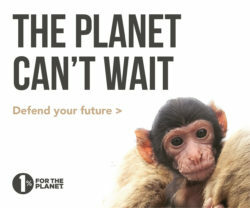 We had been invited by the World Wildlife Fund Colombia to participate in a dialogue on project finance for permanence. Project finance for permanence, an idea adapted from a common Wall Street practice, is an innovative approach to conservation that seeks to identify a permanent source of funding so that protected areas can be managed in perpetuity by the people who live there. Project finance for permanence was an initiative at the heart of the agreements that would lead to the successful protection of the Great Bear Rainforest and Haida Gwaii. In 2015, after years of protests and negotiations, 85 per cent of the land in the area was designated off-limits to industrial logging. The agreements were made on a government-to-government basis between First Nations and the Province of British Columbia and involved the forest industry and environmental groups. The agreements also established a permanent source of funds to support First Nations to continue stewarding their territories as they have done for millennia. Coast Funds, the conservation finance organization I steward as its executive director, was one of the largest permanent financing agreements in the world. When Coast Funds was established through the Great Bear Rainforest agreements, its founders hoped it would be a global model for a new type of conservation initiative: one led by First Nations that would improve well-being in their communities and conserve ecologically significant landscapes. What’s more, it would do so in perpetuity. In Colombia, we had the chance to share what we had learned from developing and initiating permanent conservation financing in BC. We also learned much from our new friends in South America. 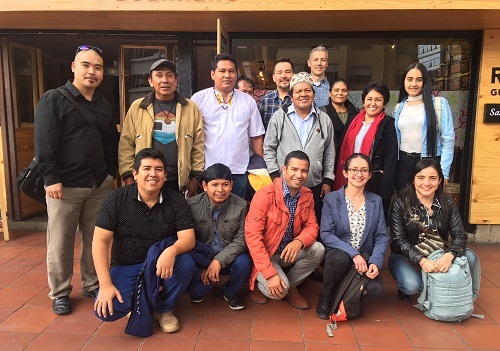 Over the course of three days, we spoke with and learned from delegates representing the Dedicated Grant Mechanism Saweto Memoria Viva from Peru, the Visión Amazonía Program from Colombia and the Herencia Colombia Program. The groups are working to establish conservation financing in their countries, similar to what has been established with the Great Bear Rainforest agreements. What we affirmed from this unique exchange was how essential it is that conservation efforts and permanent finance agreements be Indigenous-led. The funds raised to sustain protected areas in perpetuity must be governed and self-determined by the people who live in, and have stewarded these areas, for thousands of years. To do that right requires a significant amount of initial fundraising. It is a complex journey to establish a permanent conservation fund like Coast Funds, but it can result in sustaining the integrity of ecosystems while also strengthening the well-being of Indigenous people. As in in the Great Bear Rainforest and Haida Gwaii, we saw the other groups highlight the importance of ecotourism to their stewardship of protected areas. Chief Councillor Neasloss talked about how Spirit Bear Lodge and ecotourism in his Nation’s territory has dramatically increased employment, provided Kitasoo/Xai’xais youth with new opportunities to connect deeply with their territories, and other indicators of strengthening community well-being in Klemtu, BC. Representatives from Peru and Colombia emphasized, as we have in British Columbia, the need for sustainable, Indigenous-led forestry initiatives, as opposed to industrialized deforestation that lacks local stewardship. The cultural and ecological significance of the South American rainforests mirrors what we have in our province. To preserve and protect the forests that serve as the lungs of our planet, our perspective is that governments and non-governmental organizations must to work with Indigenous communities who live in and who best understand these places and how they should be stewarded. A week after we left Colombia, Peru announced the creation of Yaguas National Park, a region home to six Indigenous groups who worked for decades to convince the government the land was worth protecting. The Andes Amazon Fund contributed $1 million to create the park and offer Indigenous people in the region social development resources. In Colombia, the Herencia Colombia program continues to develop permanent conservation financing to protect and maintain 20 million hectares in the country. WWF Colombia is planning to travel to the Great Bear Rainforest to continue the learning relationship between Indigenous communities in both countries. Here in British Columbia, in the Great Bear Rainforest and Haida Gwaii, First Nations will continue to develop and lead projects that enhance the well-being of their communities and the ecological integrity of globally significant landscapes. The 27 Nations in this region are accomplishing incredible things and are proud to share their learnings with others around the globe. Read their inspiring stories and share their experiences at www.coastfunds.ca. 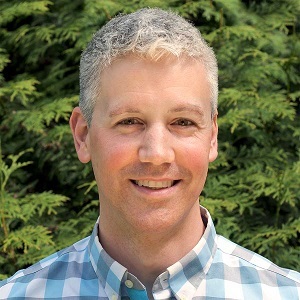 Brodie Guy is the executive director at Coast Funds where he works in support of and in close partnership with First Nations on conservation financing, guiding the funds’ investments into stewardship and sustainable development projects throughout coastal British Columbia.